A number of densely related themes run through the exhibition. First there is the question of labour, as the place in which capitalism makes itself most apparent to us in our day-to-day lives and through which we are forced to sell our time, to reproduce our material conditions. Long after the faded promise of emancipation through automation we find ourselves subject to work in entirely new and increasingly pervasive ways, as communication technologies have entered the home and our person. Coupled with this, since the 1980s there has been the assumption that private business is more efficient than the state and all public services should be handed over to private firms who in their quest for profit have driven down pay and conditions for workers. 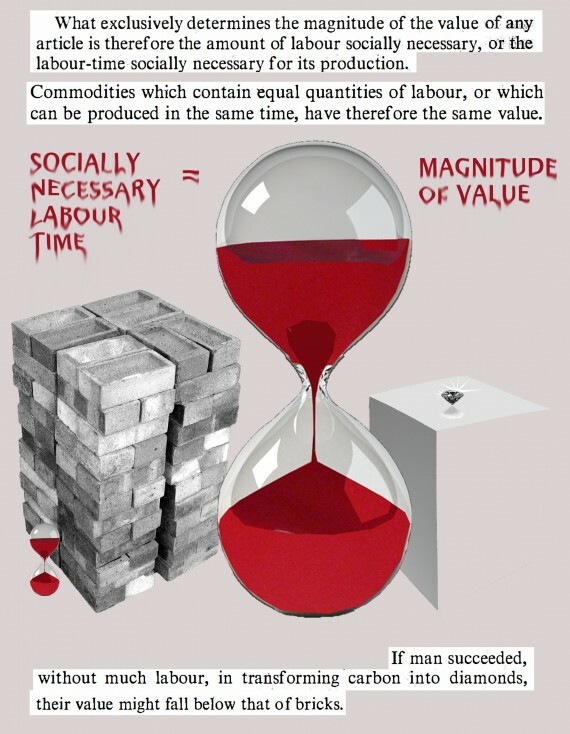 Third, and maybe most important, is the constant pressure to perform oneself and possess an individual sovereignty that is imposed on us through capitalism’s demand for competition and commodification of social bonds leaving it increasingly difficult to collectivize on grounds beyond consumer preference. The exhibition itself will be a tightly packed constellation of existing, newly commissioned and extended works, thinking through some of the contradictions we find ourselves entangled within. Whilst some of the information and ideas dealt with are necessarily complex, the exhibition will maintain a level of humour, understanding the importance for a certain lightness of touch when dealing with complexity. The Postcapital Archive makes an unorthodox reading of the fall of the Berlin Wall and the wider events of 1989 as ushering in a postcapitalist society, brought to an abrupt end with the events of 9/11. The archive itself is a processual and open project that is an attempt at reading the complex and divergent realities of the twenty-first century by virtue of their forms of representation. It contains over 250,000 documents (texts, audio files, videos, etc.) from the internet, compiled by the artist over the past ten years. Bureau d’etudes produce complex schematic maps that trace the complex networks with which it seems we have no choice but to be complicit, in this era of late capitalism. Complex of the Self presents a map of how the self is constructed, taking on not just the political and bureaucratic structures but also the philosophical and psychological underpinnings, creating a dense mapping of their interdependencies. A film of the artist at work in a high-end studio space. With various close-ups the camera pans over the chrome and white fittings of the studio, as the artist works on an architectural model of a film set on his Apple cinema display. As this is taking place a voice-over plays of the artist leaving a voice mail to the film-makers about what should be addressed in the film, including collective modes of working and the anxieties of the dissolution of the activist spirit of ’68. A ‘model box presentation’ similar to those used to pitch ideas within the theatre world. A presentation is made by Ismael Ertürk, a senior lecturer in banking at Manchester Business School, alluding to the links between Luis Bunuel’s film The Discreet Charm of the Bourgeoisie (1972) and the realms of meta-finance, where the actions of traders become similar to those of the modernist artist, acting purely in self-referential terms. Whilst trying to make sense of his experience in the Second Gulf War, Hiwa K started to educate himself about the processes of neo-liberalism. In To The Reader a single photograph of a hut in Kurdistan serves as a blunt illustration of the spatial fix of capital as society is increasingly individualized. Communal ways of life are dissolved by the promotion of the ideal of individual property rights and competitive social relations. In 1969, the artist Mierle Laderman Ukeles realized the maintenance art manifesto related to a number of other important moves in feminism at the time, understanding the role of ‘reproductive’ labour, unacknowledged yet essential to the functioning of a capitalist system. Her response is to make her work as a mother and housewife her work in the gallery, as an act of consciousness raising sympathetic with the plans of the later and more widely known campaign ‘Wages for Housework’ initiated by Silvia Fedirici. Although the oldest work in the exhibition, it maintains a depressing relevance today. ‘Everyday, Everywhere’ is a project by Learning Site (Rikke Luther and Cecilia Wendt) that took place as part of the Reykjavik Arts Festival in 2012. The project explored how the sites left vacant by the financial crisis could become banks for values that cannot be translated into monetary terms. Here the project is represented by a set of image text pieces exploring the themes further and a book featuring a one act play by Jaime Stapleton. Huw Lemmey and Ben Vickers will be producing a new work as a freely distributed publication that explores our current inability to locate any points of centrality, in network terms the relative importance of any one node within a network. The publication will identify and document artefacts capturing the current mood of non-debate, infighting and general lack of direction. At points it is jovial, poignant, direct, and occasionally cruel. Love is the new gold. Love standard instead of gold standard. The alchemical imperative of capitalism. Lovegold is a lecture-performance plotting an entangled narrative of gold, alchemy and love within late capitalism. The Bureau of Melodramatic Research (Irina Gheorghe and Alina Popa) will expand on their research into the translation of material into discourse through processes of abstraction. In the vestiges of the welfare state, in the group meeting room at the Royal Festival Hall in London, a group of artists got together to collectively read and try to understand Karl Marx’s economic treatise Das Kapital. The ongoing global financial crisis has lead to an upswing of interest in the work of Marx, as people try to comprehend the actions of the system we have no choice but to live within. In 2008-2009, Static Gallery carried out a project with its roots in 19th century painter Manet’s ‘A bar at the Folies-Bergere’, using an artwork as a mirror to reflect society. The project plots the setting up of a noodle bar on the outside of the gallery in Liverpool to be staffed by a Korean family selected by application. The project explores not only the technical, legal and bureaucratic frameworks of movement within a globalized society, but also the emotions and desires that lie behind migration. For the past few years Marika has been producing work directly emerging from her ‘money job’ working in the privatizing Swedish Postal Service. She addresses both the flexibilization and optimization of space, time and personality necessitated by the combined forces of the ‘new’ economy and the recent austerity programmes further embedding an ideal of privatization. In the context of Capitalism Catch-22 Marika spent a month talking with local artists and workers in the Netherlands, continuing her research by relating shifts in labour practices in Sweden to the local situation in Utrecht. (1)Abysmal Plan: Waiting Until We Die and Radically Accelerated Repetitionism, John Russell, e-flux, http://www.e-flux.com/journal/abysmal-plan-waiting-until-we-die-and-radically-accelerated-repetitionism/ (accessed 01.09.2013). The exhibition To The Reader curated by Benjamin Fallon, arises from the awareness that capitalism is, first and foremost, a social relation that defines our behaviour. The work in the show understands the limits of a moral critique that suggests that capital should just act nicely. Curator Benjamin Fallon points out that asking an inhuman system that is fundamentally interested in its own progress and growth, to behave in the interest of humans, is ultimately futile. The artworks opt, as theorist Donna Haraway would put it, to ‘stay with the trouble’. Instead of treating capitalism as an object that can be analysed from a cool distance, the goal is to actively map the system from within. Whilst some of the information and ideas dealt with are necessarily dense, the exhibition will maintain a level of humour, understanding the importance for a certain lightness of touch when dealing with complexity. Central to this process of understanding the world is the role of art and aesthetics – not just in the traditional sense of developing imaginative visions, but also in the use of its critical functions. A significant number of participants in the exhibition work collaboratively in a move away from the modernist ideal of the artistic genius, understanding the need to work together to gain knowledge. A shared understanding of capitalism as ‘a grammer’ permeates the exhibition as the artists at various points mimic and over-identify with the structures of capitalism and its impact on our lives today. New and existing works will be presented including Andrew Cooper, Enda Deburka, Dean Kenning and John Russell’s digital prints based on their group reading of Das Kapital, Paul Sullivan’s exploration of the bureaucratic structures and human desires lying behind economic migration through the establishment of a Korean noodle bar in Liverpool and new work developed by Marika Troili exploring the spatial and temporal shifts brought about by the flexibilisation of labour. The exhibition is situated in our present moment of crisis as the forces of neoliberal capital have increasingly eroded the possibility of collective action and in its search for ever new markets, continues with the privatisation and commodification of all relations. To The Reader will explore some of the moments in our recent history, within conditions where everything is reduced to the equivalent of exchange, and looks towards what might be coming. About Benjamin Fallon is an independent curator, writer and designer. He participated in Curatorlab, Konstfack Stockholm 2012/13, served as co-director of Embassy Gallery between 2008 and 2010 and prior to this he worked in various capacities at Edinburgh Sculpture Workshop and ONEZERO. He is a regular visiting lecturer at Edinburgh College. Recent projects include ‘You are just in the middle of the beginning’ at various locations around Stockholm, 2013-ongoing; ‘The Exhibition and its Histories’ the University of Edinburgh, 2013; ‘Banal Inferno’ CCA Glasgow, 2010; ‘Hello World’ Embassy Gallery, 2010. Benjamin is instigator of the working group ‘Let’s get together and call ourselves an institute’, researching the possibilities for new forms of institutional practice.